Are you ready to stop fussing over your eyebrows? To wake up every day with the shape and volume you’ve always dreamed of? Your answer has arrived, and Innova Spa is where you’ll find Calgary’s trusted experts. Microblading is a form of semi‑permanent makeup that is used to achieve the appearance of realistic eyebrows — kind of like a tattoo, but without the lifelong commitment. This manual method of tattooing is achieved by inserting fine lines of pigment into the skin, replicating the look of actual hair. With each unique client, we do a careful colour selection and a preliminary drawing to create brows that suit the individual, taking into account the natural skin and hair colouring of each person, as well as bone structure of the face. The brows created in this procedure will last anywhere from 9 months to a year, and then require a refresh. If you're looking to try out a new look, but don’t want a permanent application, this is a great way to maximize your look and minimize your regular eyebrow maintenance. We always do a thorough consultation with every client to make sure this is the treatment for you. We educate our clients in advance of the service to address and mitigate any potential sensation that may occur. We also apply a medical‑grade topical anesthetic to minimize any discomfort that you may otherwise feel. We know eyebrows! 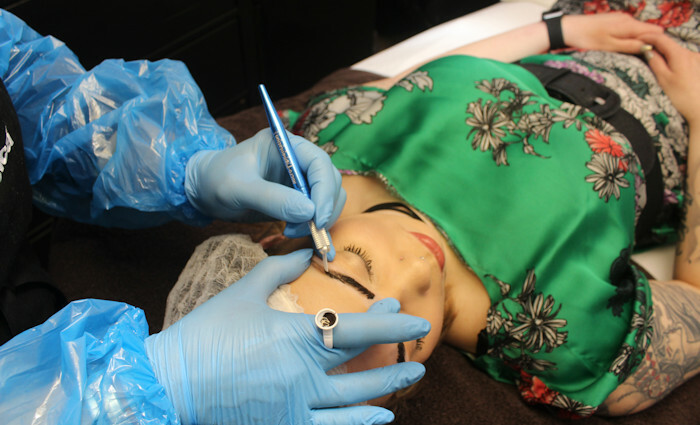 With 10 years of experience in microblading, we are some of the first technicians in Calgary to be certified, which combined with our experience in permanent makeup and eyebrow shaping, make us a trusted choice for this investment in your beauty. Through our certification, we have been trained to observe the highest standards with regards to disinfection and sterilization, insuring no cross contamination occurs. All tools and implements are sterile, single use items that are disposed of immediately after use, to ensure client health and safety.